One of the biggest worries of a bride is always the wedding dress! 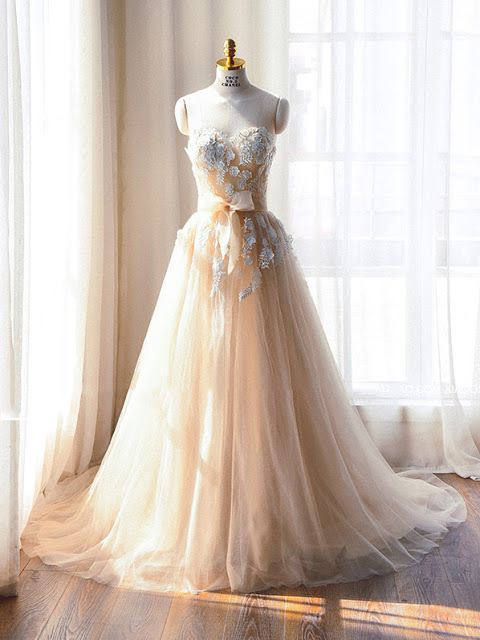 Because every woman, even if she is not huge fan of wedding, has dreamed her wedding dress! I think, that it takes more time to see and decide about the dress than to decide about the menu in the dinner! And that was exactly my problem too, since I knew what kind of dress I wanted… something simple but with lace, with a gorgeous vintage style and not white! I managed to find it!!!! Lace is all time classic for a romantic wedding and a beautiful addition on the dress, even if the dress is not from lace but has tiny lace details! And this vintage style is again one of my favorite. Somehow is full of innocence and romance…something from the beautiful past! Elegance and simplicity are combined together in a beautiful way, creating a masterpiece. These kind of dresses require a simple hairstyle (a gorgeous but simple bun or just leave them in a natural style), a minimal bu chic makeup and an even more simple flower bouquet! The perfect style for the women that adore to be minimal and chic with romantic details! Checking online you have the chance to find amazing dresses, unique just like you! Modabridal is an amazing e-shop with huge variety of dresses and so many offers! So if you are planning your wedding, just click http://www.modabridal.co.uk/long-wedding-dresses-c118767/ and find your style!